I was thrilled that there was someone out there besides me who wanted to see Judge Dredd get a second chance on the big screen. The first attempt by Stallone & Co was a farce compared to the source material, and the campy sendup that resulted became a clear road map on "How Not To" adapt a comic book for the big screen. But the character of Dredd is so awesome that I had hoped to see him get another shot. Then Karl Urban (McCoy in JJ Abram's Star Trek) got tapped for the part and I was ecstatic. 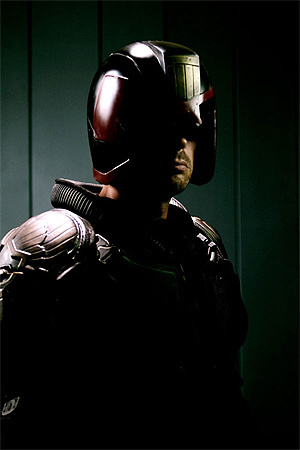 I have seen some action stills from the movie, but this is the 1st official profile shot of Urban (courtesy of Empire Magazine) with the Judge helmet on and I am speechless. This looks wonderful. I can't wait.. the film opens in December. see you there!!! After JD I want to see a Strontium Dog movie. Also ABC Warriors, Rogue Trooper and Slaine. Where are the 2000ad movies dammit? Now that's an excellent casting decision. I'm looking forward to this as well. That Stallone movie has some really great stuff going for it, specifically the design. But they just really dropped the ball on the character and the story.